Ideal for workgroups of 10+ users in large/enterprise business environments that need a fast, reliable printer for high-volume document printing which offers advanced network management, increased paper capacity and security features. Boost productivity with fast print speeds up to 50 ppm1 and produce documents on a variety of media. Manage workflow directly from the printer via the 4-line colour control panel and get quick prints from a USB flash drive. Easily meet high-volume demands with automatic two-sided printing2, up to two 500-sheet paper trays3, a 100-sheet multipurpose tray and capacity of up to 3,600 sheets4. Replace toner cartridges easily with simple one-door access and enjoy quiet, clean performance. Control energy use with HP Auto-On/Auto-Off Technology5 which turns your printer on and off based on network activity. Instant-on Technology speeds warm-up/cool-down times, saving even more power6. Track usage data in real time and apply custom energy-saving options and printer settings with the HP EcoSMART Console7. Reduce paper use by up to 50% with automatic two-sided printing2. Pre-installed Original HP toner cartridges reduce waste. Recycle them for free through HP Planet Partners8. Take control of printing practices and enforce security policies, using HP Access Control9. Command your printing environment and slash costs with HP Web Jetadmin, manage IT resources with the HP Universal Print Driver and reduce environmental impact10. Enhance security on multiple networked devices: expand your network of IP addresses with IPv6, get fast authentication and encryption for sensitive data with IPSec security. Make printing as mobile as you are with HP ePrint – now you can print from virtually anywhere11. Get the most out of your investment by adding functionality such as card authentication or new accounting measures using the hardware integration pocket12. 1 Measured using ISO/IEC 24734, excludes first set of test documents. For more information, see www.hp.com/go/printerclaims. Exact speed varies depending on the system configuration, software application, driver and document complexity. 2 Automatic two-sided printing is only available on the HP LaserJet Enterprise 600 M602dn and M602x printers. 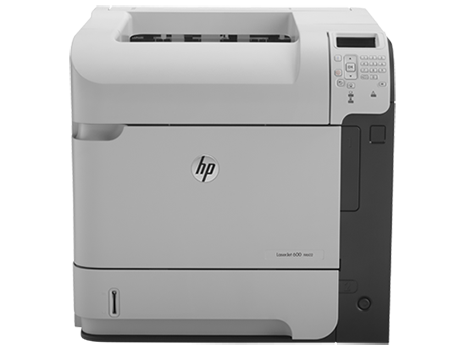 The Automatic Two-sided Printing Accessory may be purchased separately for the HP LaserJet Enterprise 600 M602n Printer. 3 Additional 1 x 500-sheet paper tray is only available on the HP LaserJet Enterprise 600 M602x Printer. 4 The 1 x 1,500-sheet high-capacity input tray may be purchased separately for the HP LaserJet Enterprise 600 M602 Printer series. 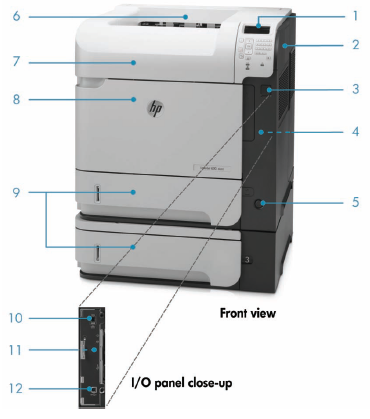 5 HP Auto-On/Auto-Off capabilities subject to printer and settings. Actual power usage may vary. 6 Compared with products that use traditional fusing. 7 Expected availability late 2011. May require a firmware upgrade. 8 Programme availability varies. Original HP cartridge return and recycling is currently available in more than 50 countries and territories around the world through the HP Planet Partners programme. For more information, or to request return envelopes and bulk collection boxes, visit www.hp.com/recycle. 9 HP Access Control must be purchased separately. 10 HP Web Jetadmin is free and can be downloaded at www.hp.com/go/webjetadmin. The HP Universal Print Driver is free and can be downloaded at www.hp.com/go/upd. HP EcoSMART Fleet must be purchased separately. 11 Requires an Internet connection to the printer. Feature works with any Internet- and e-mail-capable device. Print times may vary. For a list of supported documents and image types, see www.hp.com/go/eprintcenter. Some HP LaserJet products will require a firmware upgrade. 12 Solutions deployed through the hardware integration pocket may require additional purchase. First page out time is measured from Tray 2. Exact speed varies depending on the system configuration, software application, driver and document complexity. system configuration, software application, driver, and document complexity. Warranty One-year, return to HP authorised service centre, limited warranty. Warranty and support options vary by product, country and local legal requirements. ITSmartBuys.com is a division of Virtual Graffiti Inc, an authorized HP reseller.